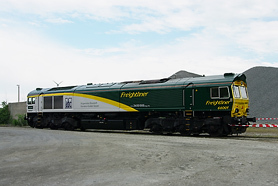 Freightliner PL provides services in the Federal Republic of Germany, through its daughter company, Freightliner DE – a licensed German rail carrier. For over 10 years now, we have been providing freight haulage services in import and export trade between Poland and Germany. Our offer of trans-boundary haulage services includes haulage of aggregates, coal, grain, rails, container transport and specialised shipments. Our advantage includes the admission to traffic in both countries of diesel locomotives, allowing for running without changing the traction unit at the border at any border crossing between Poland and Germany. As a result, we are able to offer competitive travel times and attractive freight haulage rates. Reliable and timely implementation is guaranteed by a 24-hour, bilingual dispatching service. Freightliner PL provides regular transport to and from standard gauge transshipment terminals located in Belarus and Ukraine. We help our customers to organise trans-shipment operations, as well as to clear all border and customs procedures. We provide transport services to and from the Czech Republic, Slovakia, Hungary, the Netherlands and Belgium, in cooperation with our foreign partners.